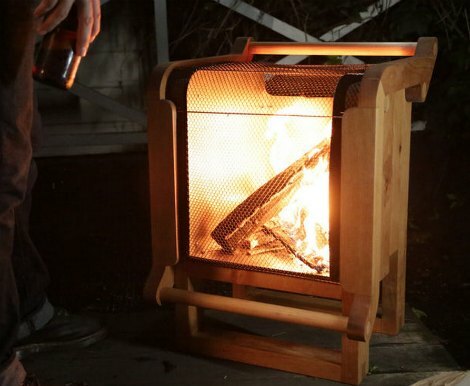 Making a portable fire pit from wood may seem counter-intuitive, but the idea is ingenious. The reason is the final product is not very heavy and is easy to move from one place to another. You can easily make a fire almost anywhere there is wood that is available. The key to this type of device is a firebox that will be made of a non-flammable material. A portable fire pit is a great option for both heat and ambiance. You can keep your unit stored until you have a reason to make a fire. One interesting aspect is being able to customize the design if you are not happy with the result. This includes adding casters to allow it to easily move along a solid surface. The most important thing about building a portable fire pit is using the correct materials. The project is part woodworking and part metal work. You will need to obtain all the tools and materials necessary to complete the project. The best part is you can find everything to build a portable fire pit by visiting any local home improvement store. The design of this device allows for ease of use and for safety. There is a screen that will prevent a fire from spitting out hot embers. A template is used to make a portable fire pit and will mean that the parts are put in place in the same way as a jigsaw puzzle. You will need to start by first obtaining the tools and materials that you will need. The next thing to do is print out the templates to make all the parts for the portable fire pit. One important detail you should note is the method that is needed to attach the panels of sheet metal for the firebox.